Regie Routman is a longtime teacher, author, and speaker who is committed to improving the literacy and learning lives of children, especially those in high-challenge schools. Her current work involves weeklong school residencies where she demonstrates effective reading and writing practices in diverse classrooms, coaches teachers and principals, and facilitates ongoing professional conversations, all as a catalyst for sustainable, whole-school change. Regie's experiences as a classroom teacher, Reading Recovery teacher, language arts coach, and staff developer led her to see schoolwide collaboration and high-level, professional learning as a necessity for increasing and sustaining achievement. As a result, Regie created the residency model where she mentors an entire school to increase engagement, enjoyment, and literacy achievement for all learners. Because the number of residencies she is able to do is limited, she created the video-based and job-embedded literacy series Regie Routman in Residence: Transforming Our Teaching. 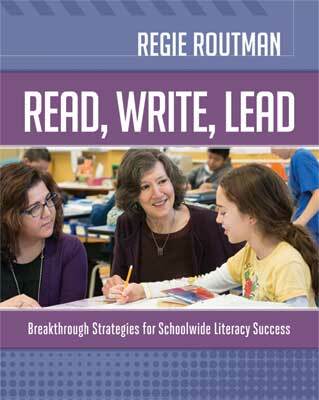 Read, Write, Lead: Breakthrough Strategies for Schoolwide Literacy Success is Regie's first book on school change and is based on the actions, practices, and priorities that lead to schoolwide literacy success. Drawing from her residency experiences, the text specifies how and why teachers and principals must collaborate as knowledgeable partners, that is, as joint experts in both leadership and literacy in a trusting school culture that becomes a Professional Literacy Community. Regie's earlier publications, especially her Essentials series—Reading Essentials, Writing Essentials, and Teaching Essentials—continue to support educators to teach reading and writing more effectively and joyfully. See www.regieroutman.org for more information on Regie's books and resources, blog, professional development offerings, Teacher Recognition Grant, and contact information. Regie lives in Seattle, WA, with her husband Frank.